In the bowl of your stand mixer, lightly whisk together starter/biga, yeast, water, and honey till the starter is blended in. Add the flour and salt, then use the dough hook to mix on medium speed for around 4 minutes. The dough should be fairly smooth but will still be slightly sticky. Turn out onto a lightly floured surface to finish kneading. Put the dough in a lightly oiled bowl and cover with cling film, or put in a plastic bag. Leave to rise in a warm place for about 2 hours — it should double in size. Turn out onto a floured surface and use a dough scraper or knife to cut into about 12 pieces, around 85g each (I use the scales to make sure they are roughly equal, without getting obsessive about a few grams here and there). Form each piece into a ball and rotate it in your cupped hand on the worktop, smoothing and tensioning the surface. Dust with flour as needed. Put each roll on a baking tray lined with baking parchment. Cover the tray with a damp teacloth and leave in a warm place for around 45 minutes. Meanwhile, preheat the oven to 200C. If you have a spray bottle, you can spray the rolls when you put them in the oven. Otherwise, put a large shallow roasting tin in the bottom of the oven while it’s heating, boil the kettle, and pour the boiling water into the tray immediately after putting the rolls in. 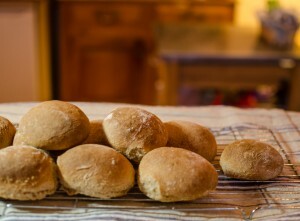 Bake for 15-20 minutes, turning the tray round after 10 minutes so that the rolls bake evenly. If using water spray, you can spray them again at this point. Test by tapping the bottoms of the rolls. When cooked, put on a rack to cool.